David Niven‘s 336 page collection of written sketches is a veritable goldmine of Hollywood tidbits: A classic film fan’s dream text. It’s one of those books which takes over your life and forces you to read it cover to cover asap. Every task falls by the wayside in its path…David Niven’s tales come first. The writing itself is the best out of any star book I’ve ever read. The gorgeous language flows off the page while jokes are effortlessly and hilariously woven throughout. If you’re in need of a sophisticated, fun read to curl up with, look no further my friends – it’s here. Shortly after this interlude Flynn took me to lunch with Barrymore at the Brown Derby in Beverly Hills. This restaurant was designed so that everyone could see everyone else; the tables were set at a series of semicircular brown leather banquettes, the backs of which fitted uncomfortably into one’s lumbar region. The waitresses, all would-be actresses, wore very short bell-shaped and highly starched skirts and spent much time dropping and provocatively retrieving forks and spoons before the tables of producers and directors. Barrymore caused quite a stir when he entered, and he boomingly table-hopped his way to our corner. 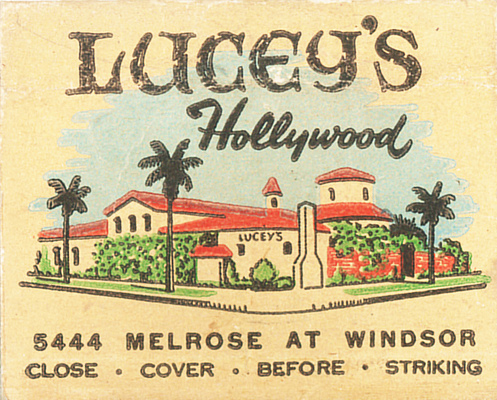 “Lucey’s,” he said to his chauffeur. When he entered the small grottolike restaurant opposite Paramount Studios, it took a few seconds for his eyes to become accustomed to the gloom. …The restaurant was filling up, and the discreet little alcoves around the main floor became nests of opportunity; at the exposed tables in the center, out-of-towners sat, taking their time over long drinks and trying to spot celebrities in the smoke-filled gloom. Restaurateur Mike prospered during World War II, and by 1945 he was firmly established at the owner-manager of the highly lucrative Romanoff’s in Beverly Hills. The imperial R was emblazoned on the front door. When he branched out into an even larger and more elaborate establishment, his loyal staff and clients and the imperial R made the move with him. Other attractions in Bring on the Empty Horses include the continuing adventures of Hedda and Louella (Chapter 4). David Niven reveals how much power these two lunatics actually had, and what they were willing to do to maintain it. I was amazed when I found out how many stars lived in fear of Hedda Hopper and Louella Parsons. I have never been able to understand how either of them managed to become such famous, important figures, but according to our friend DN, they were both utterly ruthless, willing to throw anyone and everyone under the bus for their own personal gain. They were the heads of spy rings even 007 would have envied, and were in possession of every scrap of gossip as soon as it happened. Thank heaven they are safely gone, because a world with them in it sounds like a nightmare. Her face, which was snub-nosed and pretty, was saved from being unremarkable by a pair of huge gray eyes. It was topped by a cloud of golden hair and had the great good fortune to be strategically placed above the most beautiful body in Hollywood. She has cat-like eyes and was given her first screen appearance in a solo number in a Busby Berkeley musical. She has recently given birth to her daughter, Sharon when we first meet her. I was racking my brains for a candidate and finally ended up guessing Lana Turner (even though her looks were far from “unremarkable”). But, then I did some research and found that the general consensus seems to be that Missie is Vivien Leigh. All the red herrings were DN’s effort to confuse everyone as to her true identity. This is but a tiny sampling of the wealth of classic film goodness awaiting you in Bring on the Empty Horses. You have no excuse for not obtaining your own copy, either, because Amazon has an extensive listing of used copies ranging in price from $.90 to $92. A price to fit everyone’s pocketbook. I obtained my lovely hardcover copy for a mere $5 in an antique shop. So, what are you waiting for? Get reading!